He was previously Director and CEO of the Fondation pour la recherche stratégique (FRS), the leading French think tank on defence and security (2008-16). 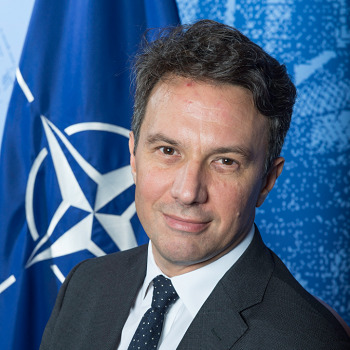 In that capacity, he served on several expert groups on the future of NATO (Advisor to the Group of Experts on the Strategic Concept chaired by Madeleine Albright in 2009-10, Member of the Group of Policy Experts for the Wales Summit in 2014). His research and publications focused on defence policy, NATO, nuclear policy, and missile defence. He was also Deputy Director for Disarmament and Multilateral Affairs in the Directorate for Strategic, Security and Disarmament Affairs of the French Ministry of Foreign Affairs (2006‑08). In that capacity, he was in charge of chemical and biological non-proliferation and conventional arms control, and served as French representative in several international negotiations and senior groups within the EU and NATO (HLTF). Prior to that, he was Special Assistant for International Affairs and Deputy Diplomatic Adviser to the French Minister of Defence (2002-06), in charge of international defence and armament cooperation, policy planning, and nuclear and missile defence policies. He was also responsible for nuclear policy and non-proliferation in the policy branch of the French MoD (1999-2002), and was an associate fellow at the Institut français des relations internationales (Ifri) (2000‑02). He also worked with the European Union Institute for Security Studies (EU-ISS) as a visiting fellow (1999-2000), with the Institut des relations internationales et stratégiques as a research fellow and editor of the quarterly journal Relations Internationales et Stratégiques (1994-98), and with Ifri as a research assistant (1992-94). Camille Grand was also an associate lecturer at the Paris School of International Affairs at Sciences Po Paris (1998-2016). Amongst other past teaching positions, he was a lecturer at the Ecole Nationale d'Administration (ENA, 2006-10) and an associate professor at the French Army Academy, Ecole spéciale militaire de St Cyr-Coëtquidan, (1995-2002). He was also a member of the Conseil général de l’armement (National Advisory Board on Armament and Technology, chaired by the French Minister of Defence) from 2012, and a member of the United Nations Secretary General’s Advisory Board on Disarmament Matters from 2014. His publications include several books and monographs and numerous papers in European and American books and journals on current strategic affairs, primarily focused on defence policy, European security, NATO, nuclear policy, missile defence, non-proliferation and disarmament. He holds graduate degrees in international relations, defence studies, and contemporary history, and is a graduate from the Institut d'études politiques de Paris. He also trained at the Institut diplomatique of the French Ministry of Foreign Affairs.